My last imaginary creature this week is the Fairy. 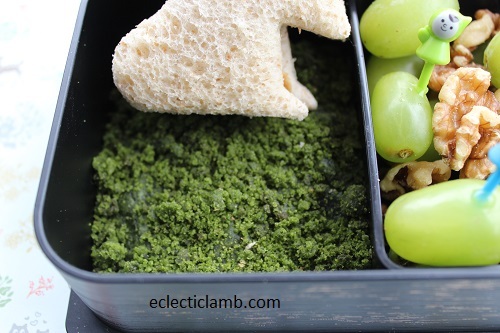 When I decided to make a Fairy themed lunch I thought it would be fun to make edible moss. A Google search revealed these moss cookies. They are surprisingly easy to make, realistic looking, and delicious. Please follow Eclectic Lamb so you don’t miss out on future themed weeks. Also if you have an idea for a themed week you would like to see, please leave a comment. Here is a close-up of the beautiful moss cookie. 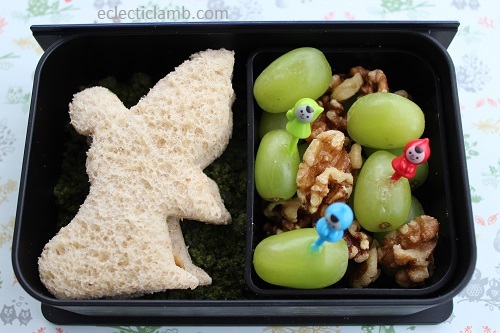 This entry was posted in Bento / Cute Food and tagged book bento box, Cookie Cutter, imaginary, sandwich. Bookmark the permalink.